2011 in the Cole Sorority: Getting so Big! Paisley is growing up so fast! She climbs on everything and anything, and can open drawers and doors now, too, thanks to lever door handles. This morning she climbed/fell out of her bed. I heard here awake and fussing, but was still half asleep and couldn't get myself out of bed, until I head the "Thud." I went in and found that the same sound had pulled Lexi out of bed, and she beat me to pick up Paisley. I realized that the crib was only on the 2nd lowest setting, so I can drop it another inch lower, so hopefully that will buy me a few more months in her crib. I was debating whether to put the crib up in our new house, or move her to a bed at that point. I guess I'll be lucky if I can keep her in the crib until the end of the summer! 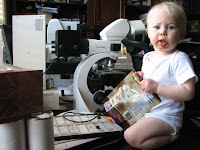 Here she is sitting on Ryan's desk next to the microscope, where she found a chocolate treat. She seems to have a built in radar for chocolate. 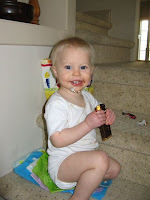 A few short minutes after getting her down from this precarious perch, we found her on the stairs, also with someone's chocolate bar. She found both Lexi's and Sierra's candy drawer and regularly raids those. She is also developing quite a little vocabulary. She can say Hi, Momma, Dad, Di-da (for Christa or sister), shoe, juice, woof (for dog), more, and night-night. At least we think she says all that. She has had a poor snotty nose and diaper rash this week, and is cutting 4 molars (one has broken the surface), so she's been a bit out of sorts this week. The chocolate radar must be a girl thing. I have to hide candy in places even I can't reach or Alaina finds it while I'm in the shower and eats it all. She's the crazy sugar hunter. Sorry we didn't make it over this weekend. I am excited to see you at Mom's on Friday though. Take care. So big and SO CUTE!